we will need: favorite strings and hook. I will knit with threads "Jeans" of orange color and slightly brown for hoofs and horns. Hook 2,5 mm. I will fill the holofayberom.Dlya neck, I use wire (you can without it, just tightly fill the neck) 13-15sm.For peephole wool for felting white color and 2 small beads. For spots 10-13 pugovichek I will be asterisks). The growth will be centimeters 17.
red dotted the beginning of the knitting of the neck. 15p. (3xV) * 3  Fill the neck with a little stuff. If you do without a wire, tighten it tightly. 31p. (4xA) * 6  Insert wire. I have 15 cm. Here is the wire inside the toy. 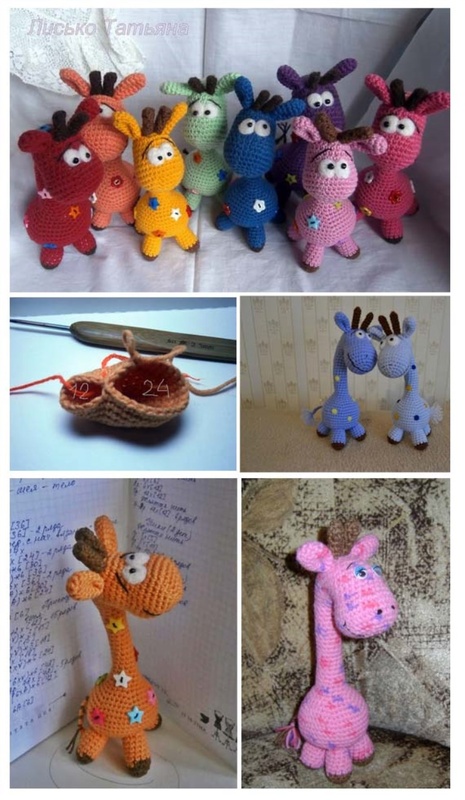 The advantage of the wire in the toy: you can change the turn and tilt of the head, change the bend of the neck and etc. We bend to tilt the head and make a loop at the base of the neck. This is how the wire looks inside the toy after all the bends. In the process of knitting, fill the torso. We leave the tip of the thread 15cm, then use them for the tail. ears are folded in half and join the edges. We try and sew ears and horns on the head of the giraffe. The tips of the threads from the horns I also do not throw out, but tie them to the tail We twist the tail of the pigtail. I look at my eyes and sew up the pupils. You can cut out the protein for the peephole from the felt or tie it to you, which is more convenient and accessible. We embroider a smile and crooks.